Try making ice cream a new way! Now that students have played with ice and salt as variables, you can try a new way of making ice cream. While the Ziploc bag method works, the results are usually more slush than ice cream. Try using the method described below for an even better ice cream making experience. You can also introduce some new variables to your students—different ingredients! This process for making ice cream is a little different than the process from the Ice Cream Science activity and requires a bit more space. Make sure that your coffee cans are clean inside. Gather some new ingredients for kids to try—cocoa and strawberry syrup are good to start with, but be creative! You could ask your students to bring flavoring ingredients in from home as well, making sure that they get their parents’ permission. You will need more ice than you did with the Ice Cream Science activity, since you will be filling small buckets instead of Ziploc bags. Ask your students what they remember about the ice cream they made in the Ice Cream Science activity. Did it turn out the way they expected? How was it different from ice cream they’ve had before? Tell them that they will get a chance to try a new way of making ice cream, and that they’ll get to try some new ingredients as well. If you are doing this activity first instead of the Ice Cream Science activity that uses Ziploc bags, ask your students if they have ever made ice cream at home before. How did they do it? What flavor did they make? Did they ever try to invent their own recipe? Have them brainstorm a list of ingredients they think are needed to make ice cream. Once you have a list, tell them that they’ll first learn how to make vanilla ice cream and that later they will invent their own recipes. Do not introduce the other ingredients as suggested in these instructions – save that for a second session. If you have not already made ice cream with your students, the first session should be about the process, and discovering what the different ingredients and materials are for. Refer to the instructions for the Ice Cream Science activity for questions and discussion points. Can you make ice cream using new materials and new ingredients? Separate children into teams of 2 or 3. If space and supplies are tight, have kids work in teams of 4. Show your students the new materials (buckets, coffee cans) and the new ingredients (cocoa, etc.) that they’ll have to choose from. This method for making ice cream is similar to the method they’ve already tried because they’ll still use ice and salt. Each team should fill their BUCKET halfway with ice and add 1/2 cup of salt and 1/2 cup of cold tap water, then mix it thoroughly. Now for the recipe—each team should add 1/2 cup of cream, half and half or milk to their COFFEE CAN, along with as much sugar, flavoring and any other ingredients they wish to add. Make sure that each team carefully measures every ingredient they use and that they write down their recipe. In previous activities, teams had a recipe to follow. Now that they have some experience, let them experiment by creating their own recipes. The one variable that should stay the same for everyone is the amount of cream—by keeping it to 1/2 cup, it will be easier to compare recipes later on. Such a small amount also ensures that the ice cream will freeze in a reasonable amount of time (the more cream, the longer it takes to make!). Once all ingredients are in the coffee can, stir it up, put the plastic lid on it and place it in an ice, salt and water-filled bucket. Make sure that the cream mixture that is in the coffee can is lower than the top level of the ice-salt-water mixture in the bucket. Begin turning the can continuously, changing direction occasionally. The can should be twisted and turned constantly to make sure that the ice cream freezes evenly. The can does not need to be spun fast, just constantly. Every 3 or 4 minutes, open up the lid of the coffee can and scrape the sides with a spoon. Replace the cover and return to turning the can! Once the cream mixture has turned into a slush, let the can rest without turning for 5 minutes. After your students have all achieved a slush in their coffee cans, bring them together to talk about what they’ve done so far. What flavors did the teams choose? Was this method easier or harder than the plastic bag method? How do they think their ice cream will taste? This discussion should last for no more than 5 minutes. Have students check on their ice cream. Is it harder than before? Have them keep turning and occasionally scraping their ice cream until it is finished. When it is close to done, they can stop turning and let it sit for a few minutes to complete the freezing process. Now it’s tasting time. Hand out the “tasting cups” or bowls, and use the tasting method described in the Suggestions section of the first Ice Cream Science activity. Give students a chance to try other teams’ ice cream as well. After they have tried the ice cream ask them how it was. Are there any other flavors they would like to try? This activity provides a great opportunity to explore a little more about what is happening in the ice-salt-water solution. Place a thermometer in one or all of the buckets and have children record the temperatures. Place a thermometer in a bucket of ice water with no salt and compare the results. What do you notice? Be creative with the new flavorings! Some ingredients, like powdered iced tea, make better ice cream than you might expect at first. 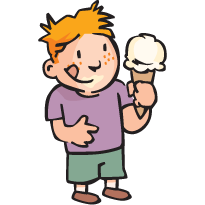 If you have not done it, try the Ice Cream Science – To Salt or Not To Salt activity. Then move on to Ice Cream Science – My Own Recipe to complete the series!